NEW YORK, NY - NOVEMBER 1, 2013 - Kino Lorber is proud to announce that it will release A Year in Burgundy , a documentary about the art of wine-making, on DVD. The film is a tour, guided by French wine importer Martine Saunier, of a year in the Burgundy region of France and follows seven wine-making families as they discuss the art and craft behind each vintage. A Year in Burgundy was an Official Selection of the 2013 Santa Barbara International Film Festival, 2013 Sonoma International Film Festival, 2013 Douro Film Harvest, and was Winner of the "Prix du Public" Audience Prize at the International Grape and Wine Film Festival Oenovideo in Carcassonne, France. 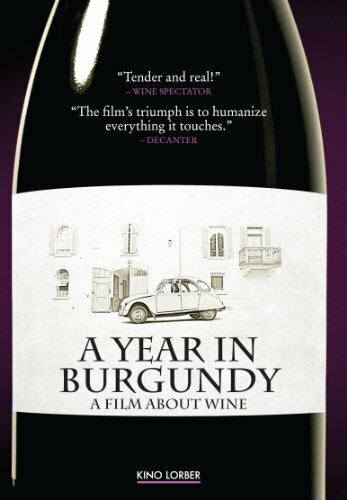 Now, Kino Lorber brings A Year in Burgundy to DVD, with a street date of December 3rd and a SRP of $29.95, giving audiences the chance to own this award-winning documentary that the Santa Barbara Independent called "...a treat for wine experts and neophytes alike." David Kennard's documentary is a guided tour of the Burgundy region with French wine importer Martine Saunier. The film covers the wine-making process over the course of an entire year, showing how the conditions of the four seasons - spring showers, drought, heat wave, hail and storms, harvest moons and the damp cold of winter - as well as the unique personalities of the wine-makers themselves shape the style and flavor of each vintage. Each vintage is a time capsule, a bottled piece of history of a very specific year, with its particular weather pattern, its crises and its triumphs. A Year in Burgundy explores the the wine-making process with the families who have turned it into an art form.